Cross-border mobility of labour has become a major bone of contention in Europe. This contribution develops a theoretical framework that makes it possible to understand the emerging European labour market as a political project. The framework combines a Gramscian account of hegemony with sociology of professions with a view to better understanding the role of skilled migrants in establishing a European hegemony. A study of the Europeanisation of the professional complex and the obstacles this transformation has met so far provide interesting insights into the complexity of the European integration as a social transformation. 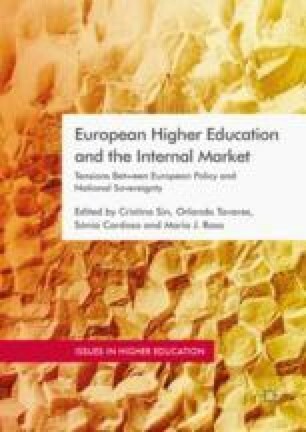 The paper also highlights the vital role that the European Higher Education Area has gained in Europeanising the professional complex in recent years, which is not without risks for higher education. I would like to thank Alberto Amaral and all the other organisers and participants of the Douro workshop (6 October 2016–8 October 2016) for their comments on previous drafts of this chapter. The usual disclaimer applies. The contribution has been developed with support from the European Research Council within the project Institutional Transformation in European Political Economy—A Socio-legal Approach (ITEPE-312331). Lisbon Recognition Convention. (1997). Convention on the Recognition of Qualifications Concerning Higher Education in the European Region. ETS No. 165, Council of Europe and UNESCO, https://www.coe.int/en/web/conventions/full-list/conventions/treaty/165.